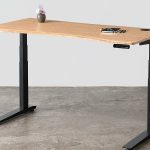 Standing desks come in all shapes an sizes and so far in our standing desk series we’ve looked at how to choose a standing desk, the best standing desk converters, and standing desk options for tall people. 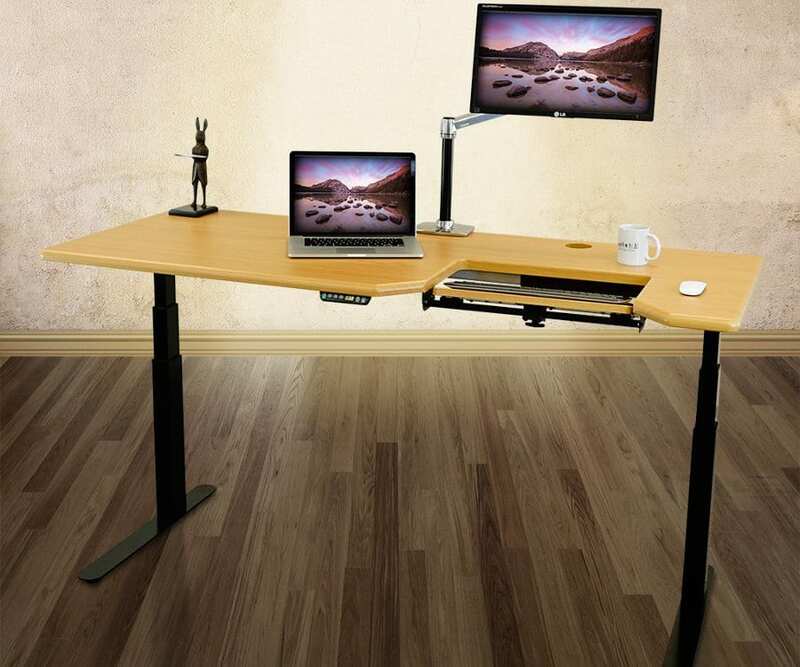 In this installment, we will look at the best height adjustable standing desks. How are these desks different from the desks in the other articles? Well, our criteria today is looking specifically at full standing desks. 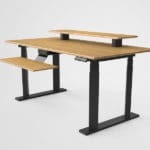 As opposed to a standing desk converter, which is an addition to your current desk, a height adjustable standing desk is a complete replacement for your current office desk. In general, these products a larger and a bit more expensive, but many people prefer having a fully adjustable setup rather than an extra converter to be placed on top of their current table. The world of standing desks is extremely competitive and there are many options out there to choose from. In this article, we have found 6 of our favorite desks (plus an additional couple for a bit of extra comparison). Each desk has been created by a different brand, and each one we believe has different strengths and weaknesses. Table Size 72" - 83" x 30" 27" - 78" x 30" 48" - 80" x 30" 60" x 30" 71" x 33" 48" - 84" x 30"
Height Range (incl. desktop) 26.25" - 50.5" (or 54.5" with extender) 24.25" - 50.25" 25.5" - 51.25" 25.5 - 50.5 29" - 48" 23.75" - 49.5"
Straight out of the gate we should explain why we have selected these products over others. We research each and every one of the products we write about to see what its users have to say. Too noisy? Not big enough? Great stability? No matter what it is, we tell you! We want to make sure that you as the reader and possible buyer of a standing desk are fully informed before making your decision. This article is a complete round-up of hundreds of reviews, analysis of the product, and anecdotal experiences brought to you in one easy-to-digest list. The size and weight of a standing desk are very important for the overall function of the desk. For the most part, weight isn’t too much of an issue for height adjustable standing desks, because once they are in place you’re not likely to need to move them that often. One benefit of a heavier standing desk, however, is the stability it creates, which is definitely a ranking factor in our list. A good standing desk will almost always have a large range of standing and seated positions. You may not necessarily need the biggest range available, so long as it is comfortable for you. Make sure to have a look at our guide to getting the correct ergonomic standing and sitting desk height, that way you can be sure to find a desk that fits your body. In general we think for a height adjustable desk, an electric version will be better for you than a manual or crank version. An electric standing desk is easier and smoother to adjust, and although manual standing desks either have a crank or air-piston lifting mechanisms, they require much more force to lift and put down. In saying that, manual standing desks are quieter since they don’t require a motor, they are usually cheaper if you are looking to save a few dollars, and they don’t require power (saving electricity costs in the long run). 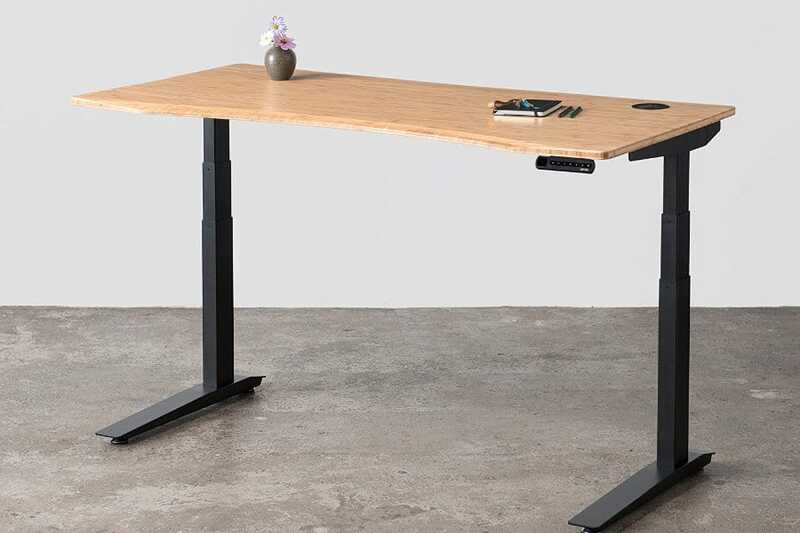 In this list of our favorite height adjustable desks, all of them are electric. If you are more inclined to buy a manual stand up desk, in the future we will be researching and writing a review of our favorite manual standing desks. We use this word a lot in our articles about standing desks and standing desk converters, but the fact is this remains one of the most important factors for these desks. Most importantly one must consider the stability when extended to full range, as this is where a worse product will become more unstable than a better product. The products we choose for our best height adjustable desks are all known to be extremely stable and reliable even when fully extended. Last but not least, the cost is always a factor! This doesn’t mean that in this list we have found the cheapest standing desks available, nor have we only provided the most expensive. The beauty of this list is that there should be a product in everyone’s price range here. 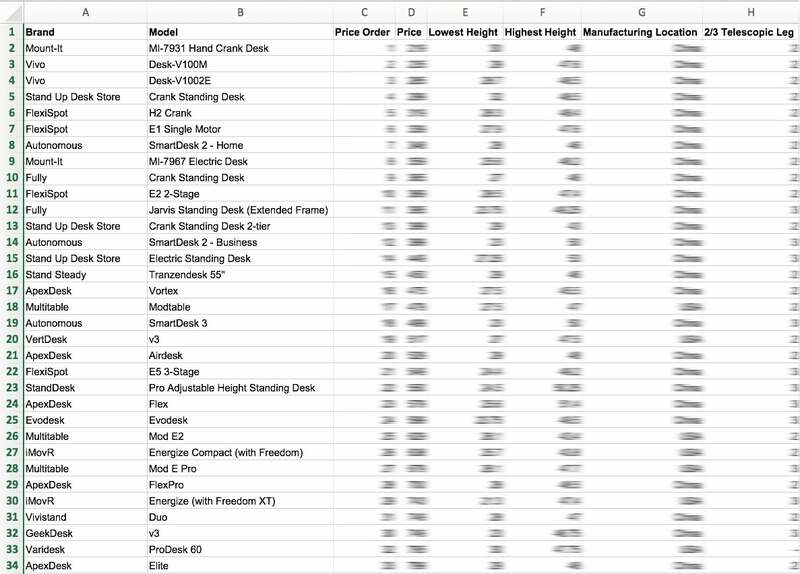 We have tried to find the best standing desks from a number of different price categories, some under $600, while others are over $1000. The only important thing here is to choose something you feel comfortable with. If you are going to be spending 40 per week at your desk, it is worth the extra money to be happy and comfortable. Update, August 2018: the Omega Everest is no longer being produced by the manufacturer and is no longer available for purchase. The manufacturer has released a new product called the Lander which looks like a significant upgrade on the Everest. Stay tuned for a more in-depth review and breakdown coming soon. If you’ve read the Painless Movement website before, you might have already seen the Omega Everest mentioned on here. Fact is, the Omega Everest is a giant of a desk, the biggest and tallest standing desk there is. What gets it on our list of best standing desks are its amazing range, sturdy build, and ergonomic keyboard tray. The slight drawback is that it is not a cheap height adjustable desk, and those with budget constraints may find this price tag a little too high. The Omega Everest is one of the most customizable height adjustable desks you can find. There are four available tabletop widths, 48″, 60″, 72″, and 83″, that come in eleven different color finishes. iMovR also allows you to customize other features, such as the base color, the position of the keyboard cutout, power management, cable management, and a caster wheel set. It would be difficult to ask for something that the Omega Everest can’t give you! For this reason alone, the Omega Everest must be considered an option by all tall people out there. At its lowest position, it is 26″ tall, reaching a height of 50.5″ at maximum extension. It ranks on our list as the tallest standing desk available on the market. iMovR also has height extenders for the legs which are 4″ tall, making the total maximum height of the Omega Everest 54.5″. iMovR has a patented design of keyboard tray which comes with the Omega Everest. The tray is, in fact, a cutout which measures 20.25 x 15″ in which they have placed what we would consider one of the most ergonomic keyboard tray solutions. Ergonomics: you can tilt the tray up to 85 degrees, taking pressure off your wrists and hands as you type. Stability: the SteadyType, as the name might suggest, is more stable than other keyboard trays, which stops you wobbling the desk and monitors as you type. The iMovR Omega Everest has a digital control panel with 4 programmable height settings. You can easily switch between sitting and standing at the touch of a button, or if you work in a shared working environment, people can set their preferred heights and many people can benefit from the standing desk. The motors in the legs of this product are manufactured by Bosch. Bosch is a company well-known for their power tools and other electric machinery, and in this case, they also produce high-quality motors. The motor quality means a few things for this standing desk: it is quiet (between 42 – 46 dB when in use), it is fast (1.5″/sec lifting speed), and it is built to last. iMovR have a great warranty period on their Omega Everest, with a lifetime warranty on the steel frame, 10 years on the moving parts and electronics, and 5 years for the tabletop. The company also offers a 100 day return period, meaning if you want to exchange the desk or simply are not satisfied and want to send it back then you have 100 days to get a refund. There is a 20% restocking fee and also you must pay for the shipping and handling, so we wouldn’t call this a full money-back deal. They often say that price reflects the quality of the product, and in the case of the Omega Everest, this seems to hold true. This product has been built with a sturdy frame, laminate desktops, ergonomic features, and powerful motors, so it’s going to come at a cost. This product is very customizable, so it is hard to give an exact figure, but the price can range from anywhere between $1200 and $2000. On the low end you have a smaller table without any customized features, and on the high end is the largest size available with every customizable option available. See the complete Omega Everest review here. 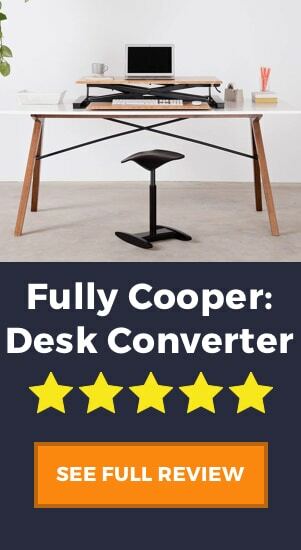 Jarvis is a name that pops up fairly often on this website, for example in our best tall standing desks article, both the Jarvis and the Cooper (products by Fully) are in our top 6. Fully combines design, functionality, and a reasonable price to boot. The Fully Jarvis is one of the most customizable standing desks available in terms of desk size. It comes in two basic shapes, the regular rectangle in 7 size options or a contoured cutout version in 3 sizes. It allows for a number of other customizations including frame color, wire management, power banks, simple or programmable handset, drawers, and shelves which provides you a great deal of customizability not only in terms of design but most importantly for function. In our opinion, the best feature of the Jarvis is its value for money. For what you get in terms of design, build quality, customizability, the Jarvis is very affordable. From the smallest and least customized option to the largest desk with most add-ons, you’ll look to pay in between $400 and $800. Not too shabby if you ask us! Like its desk converter counterpart, the Jarvis is finished with a beautiful bamboo tabletop. We love the look of bamboo, so we give it top marks for style and design. Most importantly though is the fact that it is durable and environmentally friendly, as bamboo is one of the most sustainable woods available. There are two types of headset available, one which is programmable and one which is not. The non-programmable headset just has two basic up and down buttons that allow you to adjust the height of the desk. If you want to add the programmable headset which allows you to preset 4 different height settings, then you will need to choose the headset add-on for $39. The Jarvis has one of the largest lifting capacities when it comes to height adjustable desks. Remeber, the lifting capacity is of the frame itself and doesn’t include the weight of the tabletop, so you must factor in the size of your tabletop before adding more weight. In saying this, we think it would be pretty difficult to load up your desk to 350 lbs, so you’re pretty safe filling your desk with whatever you need! We must mention that there have been a few complaints about the top-level stability of this unit. It is one of the tallest height adjustable desks on the market, and naturally the higher the product rises, the more unstable it will become. Unlike the iMovR Omega Everest, which has many keyboard tray customizable options, the Jarvis has none. The Jarvis is just a single platform tabletop that doesn’t offer any form of ergonomic keyboard. Although some people prefer the extra space this gives you, we at Painless Movement prefer the ergonomic benefits of an adjustable keyboard tray. The Jarvis does offer however a monitor platform as an add-on. This means that your monitor will sit at a higher level than your keyboard which will provide a more ergonomic position for your hands. If you are a bit of a DIY-er and want to add your own tabletop to the Jarvis frame, then you can purchase the frame only from Amazon. If you’re still not sure, make sure to read our complete Fully Jarvis review. The Uplift is another great electric height adjustable desk that is customizable, ergonomic, and has a very impressive adjustable range. A common feature among the best height adjustable desks is their customizability. Like the previous products, the Uplift Desk has many different options: adjustable size, tabletop materials, wire management, powered grommets, keyboard trays and more. Also, like the previous two desks, you can also add a programmable headset add-on rather than a traditional up and down headset. This allows you to set 4 height levels. A great feature of the customizability is the tabletop options. Unlike other products which only offer laminate, or only offer bamboo, the Uplift Desk has many different styles of desktop. The range includes MDF and Laminate, bamboo, reclaimed wood, rubberwood, eco wood, and solid wood. 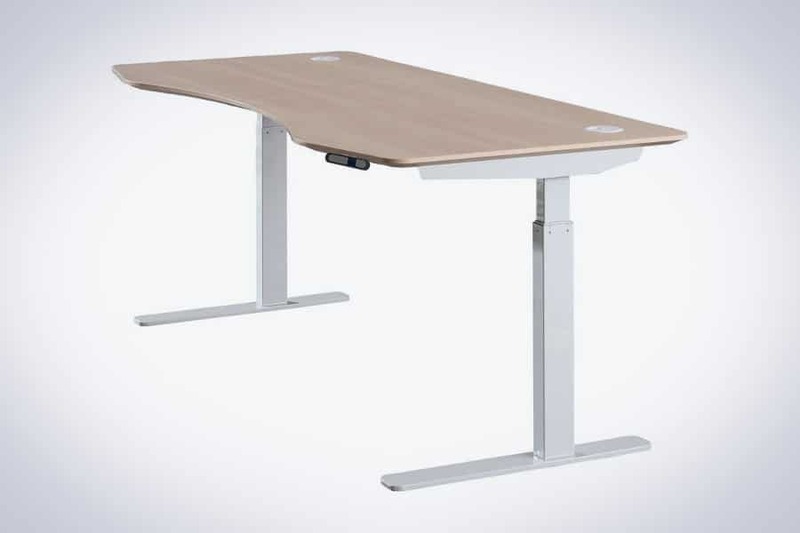 The Uplift is one of the tallest standing desks on the market and has a great adjustable range. 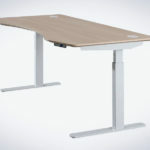 The range is very similar to the Jarvis, which is considered one of the best standing desks for its adjustable range. The main difference between the two is that the Uplift Desk sits about one inch high at both the collapsed and extended heights. By a margin of 5 lbs, the Uplift Standing Desk beats out other height adjustable desks for the title of strongest desk frame. The frame is capable of lifting 355 lbs, including the desktop, so will be more than enough for multiple monitors, monitor arms and more. Our favorite feature of the Uplift Desk is the additional keyboard tray. This doesn’t come standard with the desk and instead is a paid addition. Unlike the iMovR that has a keyboard cutout area, the Uplift Desk keyboard tray connects to the desktop and sits out further from the desk. The option to put an ergonomic keyboard tray with your desk is great for two reasons: it is better overall for wrist and arm health, and it gives you more working space. One complaint we have seen from a user was the quality of the laminate tops. It seems that they can easily bubble with any contact of water. This obviously doesn’t affect the wooden desktops and is only an issue we have heard from the laminate. The Uplift is closer in value to the iMovR Omega Everest in that at its cheapest it is close to $1000, and with all the add-ons you will be paying almost $1600. If you already have a desktop, there is another option to only buy the frame which you can buy directly from Amazon, saving you quite a lot of money. We previously wrote a huge article on Varidesk and their products, and of all their products we think that the ProDesk 60 Electric is one of the best. Despite not being customizable, the ProDesk 60 has a number of great features, and also at a very reasonable price. As we have mentioned, stability is not easy to achieve with 2-legged height adjustable desks, so the added crossbar support is a welcome feature. This crossbar reduces the lateral and front-to-back wobble and shakiness from the Varidesk frame. At a shave under $1000 we think that the Varidesk Prodesk 60 is pretty good value for money. Obviously, you can go for something cheaper like the Jarvis, but remember that there are many add-ons that come included in this price that don’t with the other desks. 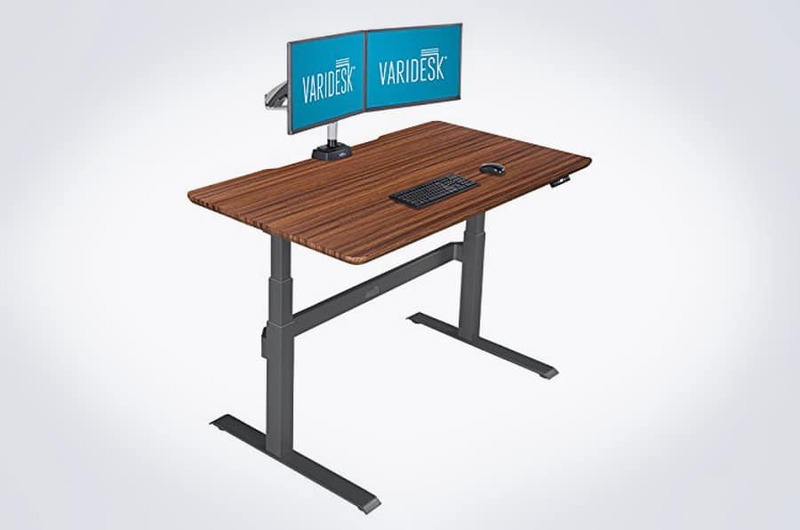 Varidesk is well known for their high-quality products, and their prices generally reflect in the design, quality, and build of each product. As we mentioned, there are many features that come included in the stated price, something that is not true of other products. We like the fact that the pricing is transparent and you know exactly what you get for what price. This obviously comes at the cost of customizability which we will talk about later. As with the other products we have listed so far, the Varidesk Prodesk 60 has a programmable headset. The Varidesk only has 3 presets available, whereas the previous products have 4. A fantastic feature of the Varidesk Prodesk 60, as with most Varidesk products, is the ease of assembly. Once this product arrives at your door, you can be up and running in 5 minutes. One major drawback of the product is the lack of customizability. Although this creates some positive factors like the set pricing, many people don’t need all the same features. The desk comes with all the add-ons that you’d expect, like cable management and the programmable headset, but there is no option to not pay for these if you don’t want them. Again, this is a problem with a lack of customizability. As you can see, the cheap standing desks don’t have the added keyboard option, it is generally something that you’ll need to pay a premium for. Although many people don’t need or use a keyboard tray, for those who suffer from wrist pain we definitely recommend finding a product that has this option. We love the crossbar for the fact it adds stability to the desk, and nothing is worse than a desk that shakes. This same crossbar, however, creates other issues. It is placed low down on the legs and for some people can get in the way while sitting down (if you swing your legs for example). Other products forgo this crossbar or place it much higher on the desk (just below the tabletop) so it is not in the way. Alternatively, you can buy it directly from Varidesk. Don’t forget to see a more in-depth Varidesk ProDesk 60 review if you want more details about this product. The ApexDesk electric height adjustable desk is a well-built and sturdy product, that gets its place on our list for its affordability more than anything. 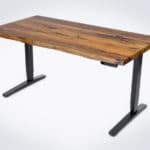 When you look for the best standing desk it is hard to find something as good as this desk at this price range, so the ApexDesk is a real find in this sense. Now, the Apex Elite 71″ is not the cheapest standing desk available on the market, but for what you get it is the cheapest on our list. Like the Varidesk, it is not a customizable product so there is just one set price, which we believe is great value for money. For a desk that is 71″ x 33″, made with a strong laminate desktop and sturdy steel frame, we think that it is a pretty good deal. As with all the previous products, the ApexDesk also has pre-programmable heights. What we like about this feature is that ApexDesk includes this as part of the desk and not as a paid add-on. Although not quite as easy as the Varidesk in this category, the ApexDesk is known for its fast assembly. Once the product arrives at your door, you will be standing up at your new desk in less than half an hour. The product itself is extremely heavy, weighing in at around 160 lbs. Now some people may think that this is too big and heavy for their liking, but we see this as a positive factor in terms of stability. Many users comment on the great stability of this desk, and it is clearly a domain that the ApexDesk excels in. 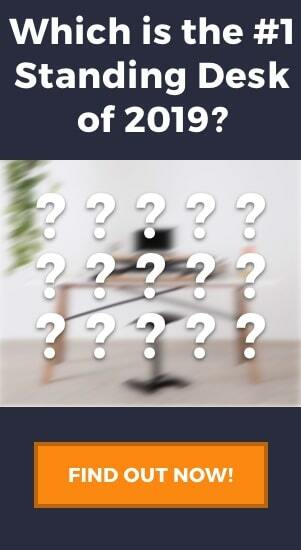 Of all the adjustable desks on this list, the ApexDesk has the smallest adjustable range. For that reason, we wouldn’t recommend this product to taller people, however, it is still useful for the large majority of users. This is mainly due to the leg design which is 2-part telescopic, as opposed to 3-part like many other desks. Although this takes away from the overall height, we do believe it adds to the stability of the unit overall. The ApexDesk Elite comes with pre-made grommet holes in order to feed wire and cables through the desktop. It is missing full cable management features like a mounted cable tray at the back of the desk. Most other desks have this feature as an add-on, and the Varidesk even has this as part of the original design. Like the Varidesk, the ApexDesk Elite is not customizable. The desk is offered in a 60″ model for those looking for a smaller and cheaper desk, but apart from that what you see is what you get. We don’t like that there is no option to add a cable management or a keyboard tray, and the desktop comes contoured with no option for a standard rectangular desk shape. If you would like some more information on this product, we have also written a full review of the ApexDesk Elite. 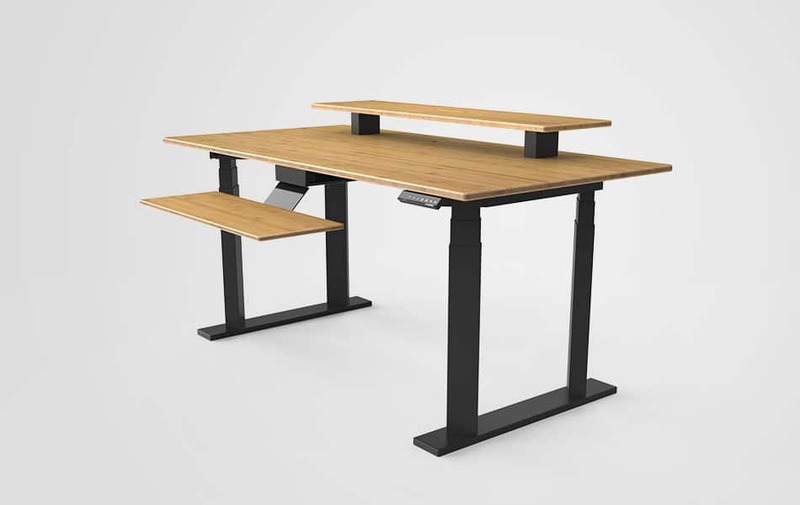 The EvoDesk Pro is different from our other standing desks in one area: it has 4 legs instead of 2. Now, many people prefer the style of only having 2 legs, but it must be said that the extra 2 legs offer a lot in terms of stability. As one review of the EvoDesk Pro says, “this desk is the Lamborghini of standing desks”, so let’s see why! If the most stable standing desk is what you are looking for, then this 4-legged EvoDesk Pro could be for you. The EvoDesk distributes the weight of the desktop evenly over the 4 legs, and the legs are angled at 45 degrees to each other, creating a perfectly stable surface. Just one look at the photo of the EvoDesk above will give you an idea of the customizability of the product. You can choose the size, shape, and material for the desktop, as well as wire management and other smaller add-ons. Our favorite is the keyboard tray AND monitor platform (as seen in the above image), which create a really great ergonomic desk. Once again we see a product with a programmable headset. Like a few others on this list, this headset is a paid add-on, the stock headset only has up and down control. 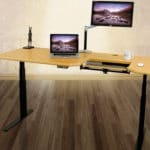 We mentioned before that the Uplift had the largest lifting capacity of the standing desks, and this is true for 2-legged products. When it comes to four legs, however, the capacity of the desk is far greater. The EvoDesk Pro frame can support up to 500 lbs, and can even lift at a rate of 1.5″/sec, so you know the motor is powerful. 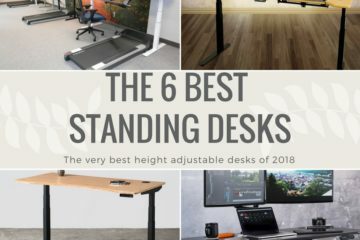 The EvoDesk Warranty is not the shortest warranty we have seen for a standing desk, but it is not as long as the other products on this list. Be aware that water damage is considered negligence and won’t be covered, so make sure to take care of the desktops (laminate desktops are prone to bubbling when wet). 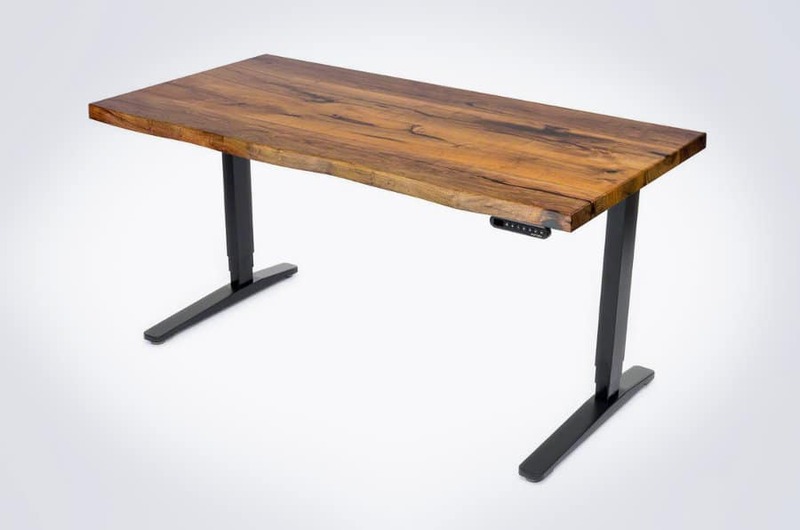 As a bare-bones standing desk, the EvoDesk Pro is already over $1200. Once all the add-ons have been selected and you have your standing desk properly kitted out, then it is possible that you will have to spend $2000. 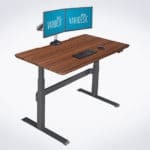 This is similar in price to iMovR Omega Everest, and it is what we would consider the upper end of standing desk prices. Perhaps the most worrying concern for someone looking to buy an EvoDesk Pro is not about the product but about the company. Some people have complained about the lack of quality customer service and difficulty getting in touch with the company and their customer service team. As you can see, there are some pretty common traits that the best standing desks all have. A good height adjustable desk must be a combination of stable, strong, well-built, customizable and good value for money. It is clear that the more you improve one part of a desk, the more other parts tend to suffer, such as height and stability, or price and customizability. This is exactly why we tried to find 6 desks that had all the core features that a standing desk must have, but that have slight differences that can suit different people. The trick is deciding what are the most important features for you! We hope you have found what you were looking for in this list, and we’re confident you’ll be happy to have one of these in your office or home. Great article. I too have been exploring the most suitable standing desk options and I came across this BBC Video on “How to Stay Young” featuring Yo-Yo DESK®. Far too often we see people standing at incorrect heights or leaning on their desks. Yo-Yo DESK® provide FREE GUIDELINES to ensure that everyone can adopt the best practices when starting sit-stand working. When choosing a standing desk solution, you could go for an expensive all-in-one desk (usually with a built-in motor) or choose a cheaper more portable option and risk some serious wobble. Now there’s a new third option, a semi-portable ‘Desk Riser’ like the Yo-Yo DESK® 48. As I already had my desk at home and didn’t want to replace this, a device such as the Yo-Yo Desk was the solution. I have the 47-inch, and this is plenty big enough for my 21-inch monitor with plenty of room to spare on the top for phone, iPad coffee cup etc. The keyboard table is plenty big enough for a keyboard and mouse and room to rest your wrists when typing. This is a very nice system which despite its weight, operates smoothly and easily without any need for ‘muscle’. The height can be adjusted in small increments so is easy to find the perfect setting. I am 5’9″ and use it near its highest setting so anyone over 6ft might need a taller one or to simply elevate the screen a little.